What enhances the curb appeal of your home more than a freshly painted exterior? You may have noticed your home’s outward appearance is looking a little faded—possibly even peeling. So, it may be time to head to the paint store, purchase your paint supplies and give your house the facelift it needs. Painting a home’s exterior is similar to painting the interior. A lot of the project’s success revolves around how well you do the prep. With that in mind, here are the steps you need to take to make sure your home’s exterior is the envy of the neighborhood. Clean the surface. You’ll want to make sure the house is clean of dirt, dust, grime, and chalking. Power washing can be an efficient way to achieve that. Add the appropriate house wash product to the washer’s detergent dispenser. Talk to your local paint retailer to determine the power-washer psi that is appropriate for your siding. If you have concerns about using a power washer, consider hiring a pro to do this step for you. 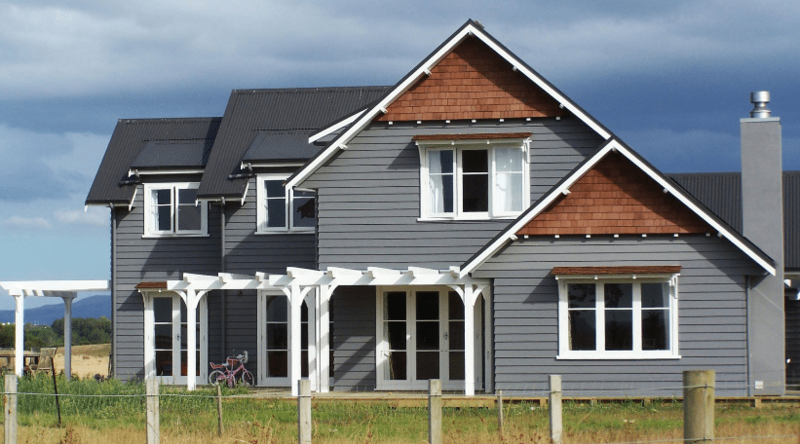 If your house siding shows signs of mildew, you can remove it by spot-cleaning with a diluted bleach solution or a commercial product that is formulated to remove mold, mildew and algae stains. When using bleach or detergents, make sure you protect plants and other surfaces around your home and use the appropriate self-protection products, such as gloves and face masks. Prep the surface. Scrap away loose paint. Use caulk to seal cracks and joints around window frames, door frames, etc. Use painter’s tape (appropriate for outdoor use) and other masking products. Protect outdoor plants from paint splatter. Moisten the plants before covering them with plastic sheeting. Prime the surface. Use a primer that is appropriate for a home exterior. Your paint store staff will guide you in the right direction. A properly applied primer will provide you with better adhesion, better coverage, and a more uniform appearance. Determine your color scheme. Typically, outdoor color schemes have three colors: one for the body, another for the trim, and a third for accents, such as shutters and the door. Pick a color scheme that is in keeping with the style of your house. For instance, a Victorian-style home looks best with a contrasting color scheme to show off its architectural embellishments—i.e., a gray-blue body color, white trim and burgundy accents. A modern home may have a more monochromatic color scheme—i.e., a taupe body with beige and brown accents—but perhaps a splash of color with a muted red door. Choose a quality paint. It’s worth the extra money to buy a top-of-the-line paint. Not only will the paint job look better, but it also will last longer too. Top-of-the-line paints typically last eight to 10 years, whereas a middle-grade paint may only give you half that life. So, if you spend 50 percent more for a quality paint, you’re really coming out ahead. Apply the paint. Typically, rolling and painting might be better for the do-it-yourself than a paint sprayer. Paint sprayers require more expertise and precision as well as expert masking to avoid getting the paint where you don’t want it to go. If the house is small enough to paint with brush and roller work, that may be the best course of action for consumers. This is likely to be a multi-day project, so make sure you complete one side of the house at a time before proceeding to the next side. As you tackle each side, do the body first, the trim second and any accents, such as doors and shutters, last. Consider hiring a pro. If you take into account that a quality paint job will last longer than a poorly done job, you may want to consider hiring a pro. Can’t afford it, you say? Do the math. When you pro-rate the cost of the labor over an eight- to 10-year period, you may find out that hiring a painter is within your budget after all.